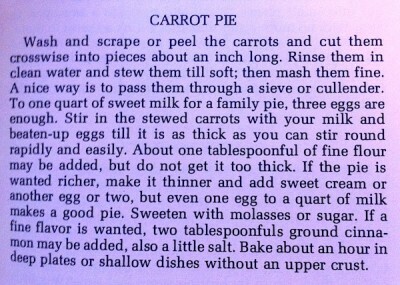 Carrot…pie? A Recipe Swap and a giveaway! Perhaps I reacted to this month’s Burwell General Store Recipe Swap recipe a little differently than most people. I was ready to cook up some carrots and bake a pie! Carrot pie sounded like another delicious variation of some of my favorite pies: pumpkin and sweet potato. 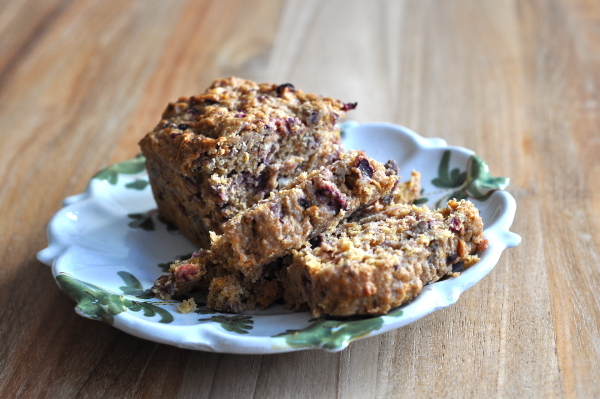 Could carrot pie be even better because of what it has in common with carrot cake (my absolute favorite)? I wanted to find out whether another orange vegetable would make a lovely, fall-flavored pie so I decided to stick closely to the original recipe. 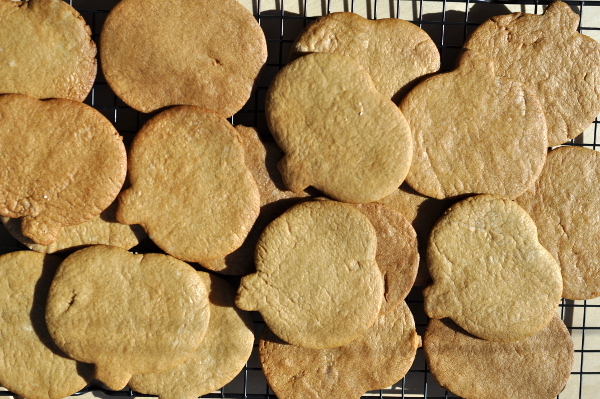 That turned out to be pretty easy, since the recipe was so vague that I didn’t have a rigid ingredient list to follow. It reads something like an oral history gathered by some culinary folklorist. Can I have that job, please? I steamed “the carrots”, added them to milk and eggs, sweetened them with sugar, and added cinnamon for spice. That wasn’t all, of course. The full recipe is at the bottom of this post. My take on carrot pie includes ricotta cheese and allspice but no crust. I gave up baking custard pies in crust long ago. All I want is the filling so baking that in little ramekins or muffin cups makes dessert much more enjoyable to me. Individual custard cups may not be quite as pretty as a whole pie and sometimes it’s nice to have some crunch with your silky-smooth filling. That’s where this bag of granola comes in! I happened to have a bag of Cherry Berry Granola in my pantry from the NatureBox each blogger received as part of the Foodbuzz Festival gift bag. 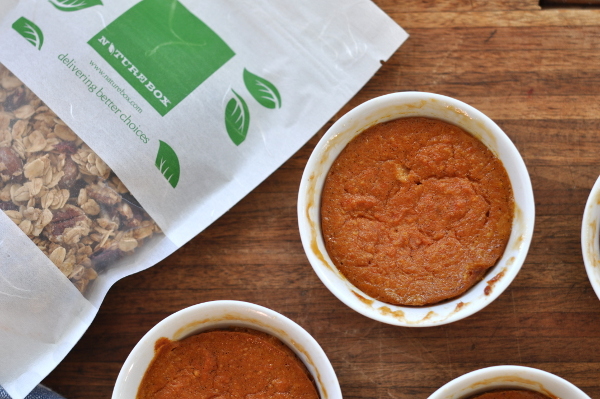 NatureBox delivers a monthly package of healthy snacks anywhere you need them (in the U.S.). They come in neat little resealable pouches and have already saved me from a snack black hole at least once. 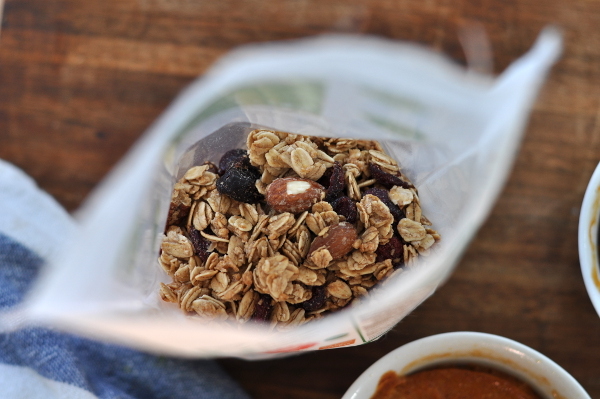 I love the dried fruit, nut mix, and Blueberry Almond Bites but I’m especially excited about the granola, since it’s on the light side – just how I like granola – with a good ratio of oats to whole almonds and dried berries. 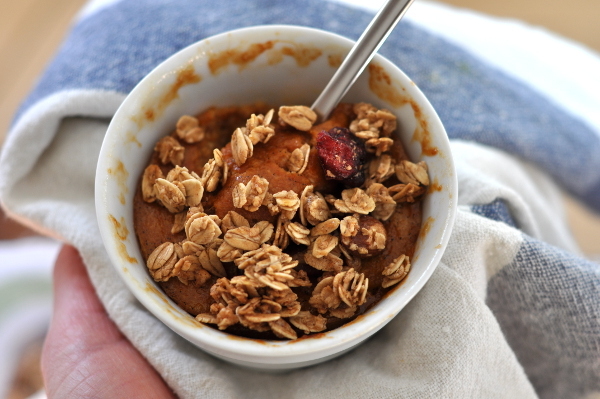 The crunchy granola was a perfect topping for my carrot custard, which was still warm and gooey when I snacked on it yesterday afternoon. 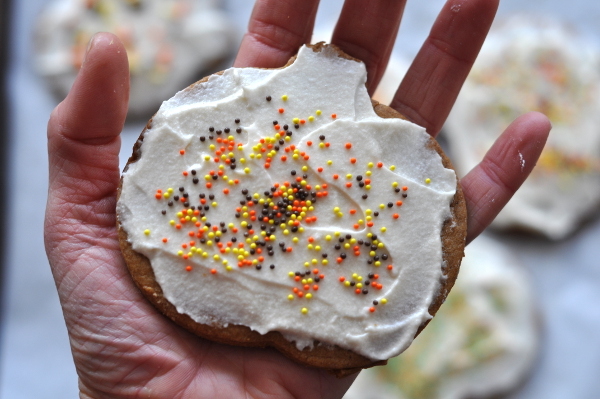 It was reminiscent of pumpkin or sweet potato pie but with more substance, thanks to the ricotta cheese, and plenty of flavor from the vanilla bean and spices. Lee and I did a bike/run brick workout that morning so I snacked for the rest of the day. 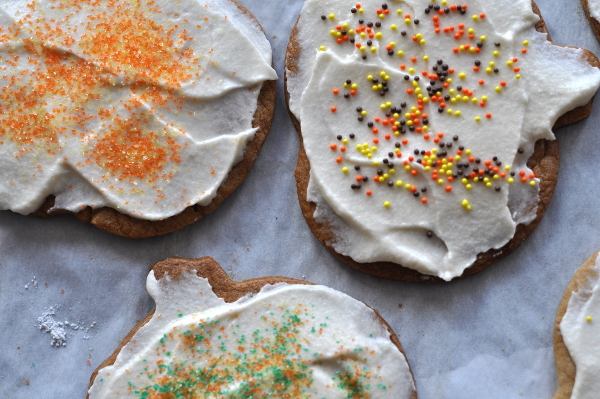 The rest of my little carrot pies went in the fridge for weeknight desserts. If you’d like to try some healthy, convenient snacks for yourself, NatureBox has generously offered one of their future month’s boxes to one of my lucky readers! All you have to do is comment on this post telling my where and when you most need a snack during the day. The winner will be chosen at random from those comments. One entry per person, please. I will announce the winner in 1 week. At this time, NatureBox can only deliver to U.S. addresses and cannot customize box contents. 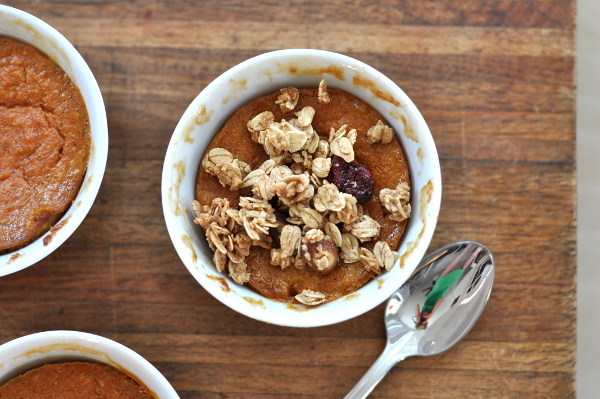 Be sure to check out the NatureBox Blog for delicious recipes and snack ideas! 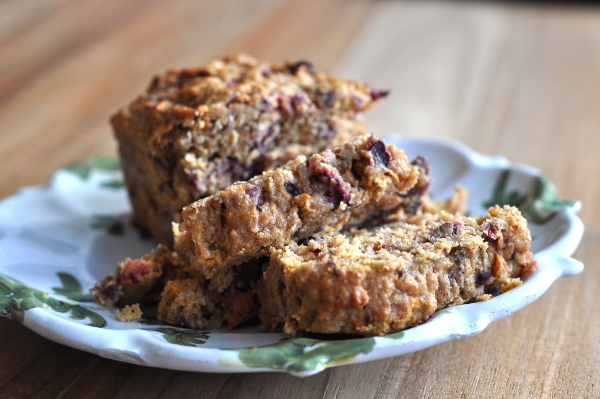 You’ll also find inventive recipes inspired by carrot pie from my fellow recipe swappers below. Cut carrots into 1 inch chunks and steam until tender. Puree carrots in a food processor or using a hand blender. 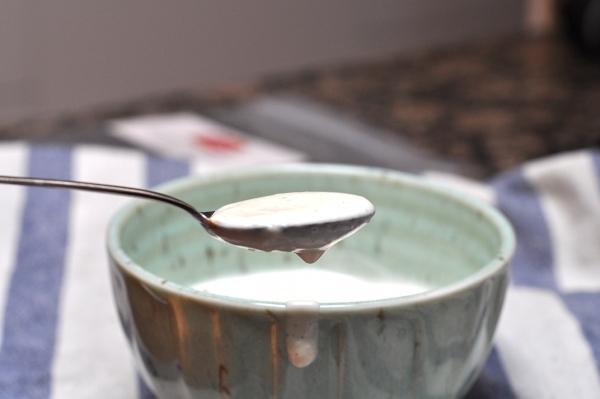 Add ricotta cheese, milk, sugar, spices, salt, and vanilla, stirring with a whisk until well blended. Add carrots and stir until combined. 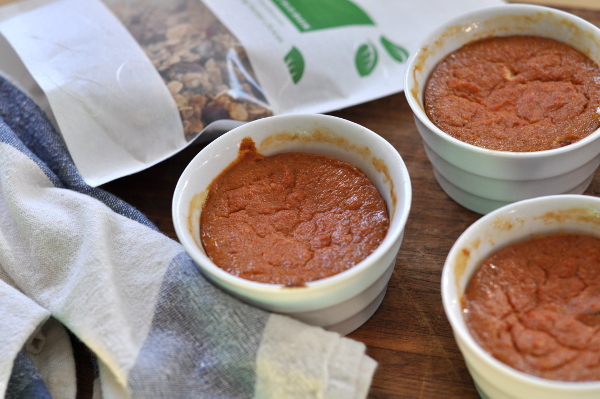 Pour batter into ramekins coated with a little oil or silicone muffin liners. 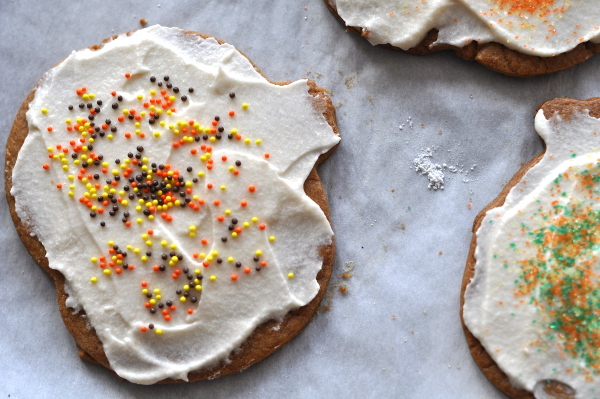 Place these on a baking sheet. Bake at 350 for 30-40 minutes or until the center of each pie is solid and the edges begin to pull away from the dish. Cool on a wire rack until ready to eat. Pies may be served warm or chilled, topped with granola, cookie crumbs, or even whipped cream. If using muffin cups, you may remove pies form the cups before serving as long as they are significantly cooled. * Yogurt or pureed tofu may be substituted for ricotta. 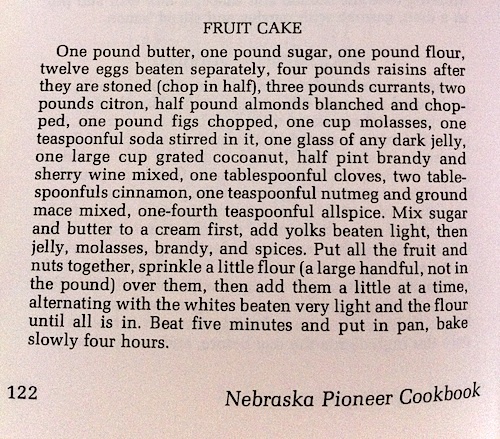 I’ll try to keep this short and sweet, like a jar of pudding. 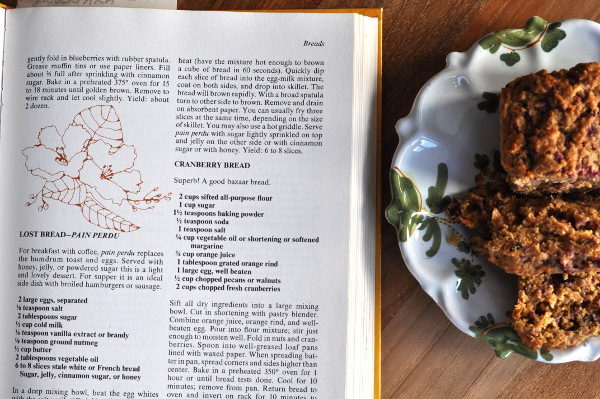 The Vintage Recipe Swap returns! After a several-month-long hiatus, our busy lives finally permit another epic recipe remake. We grew, we split, we frantically (at least on my part) went about our lives for a few months, and now we’re back together as one recipe-hungry group again. 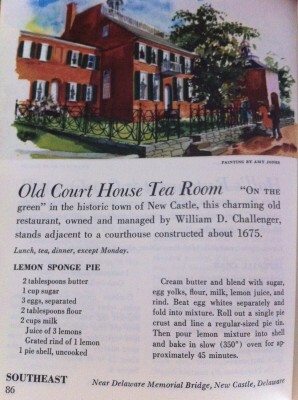 Christianna provided us with an excellent recipe to rekindle our imaginations: Lemon Sponge Pie from the Old Court House Tea Room in Delaware. 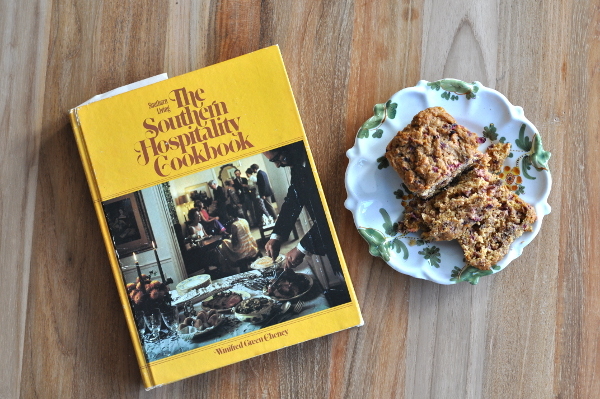 We are working our way through The Second Ford Treasury of Favorite Recipes From Famous Eating Places, compiled in 1954, hence the geographic context. mmm pie. Lemon pie makes me think of afternoon tea drinking and sophisticated conversation. Maybe it’s the Delaware tea room bringing that scene to mind but I think of lemon as a light, refreshing flavor that is available year-round. In this season of syrupy summer fruit desserts, a little lemon is a welcome reprieve. I am trying to take it easy on myself nowadays: no elaborate undertakings in the kitchen when there is so much to do outdoors. I’m not baking bread. My pizza stone has seen very little use this summer. I didn’t feel like making pie. I know what you’re thinking: What self-professed baker/blogger is too lazy to make pie? Pie has never really been my thing. I’m a muffin kind of girl, remember? Even those requite too much portioning of ingredients into little tins for my patience right now. And now to the un-pie. My favorite thing about pie is custard pie filling (mmm crustless sweet potato goat milk pies). For my take on lemon pie, I decided to embrace summer simplicity and my love for creamy filling with a no-cook lemon pudding. 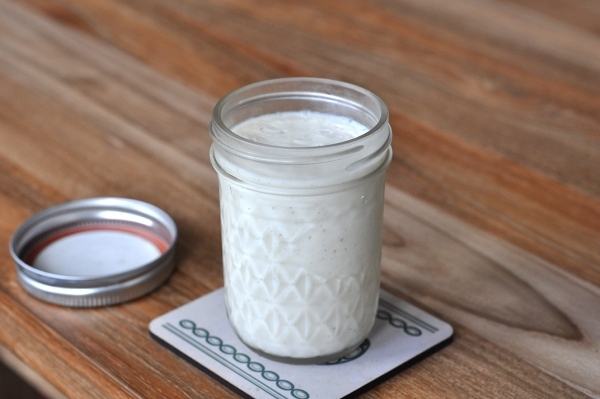 Two things make lemon pudding better: vanilla bean and eating it out of a jar. Whipped cream and some simple vanilla wafers would be fantastic too but I didn’t have either of those. Walnuts made a nice addition. I completely made up this recipe and I am completely satisfied with how it turned out. The spoon I dipped into the blender came out with a very lemony, creamy bite of heaven. I even sneaked some healthy things in there, balancing out the tangy Greek yogurt with silken tofu and keeping the added sugar to a minimum with only 1/4 cup of agave nectar. I have to warn all traditional lemon-pie lovers out there that this dessert is very lemony and not very sweet. 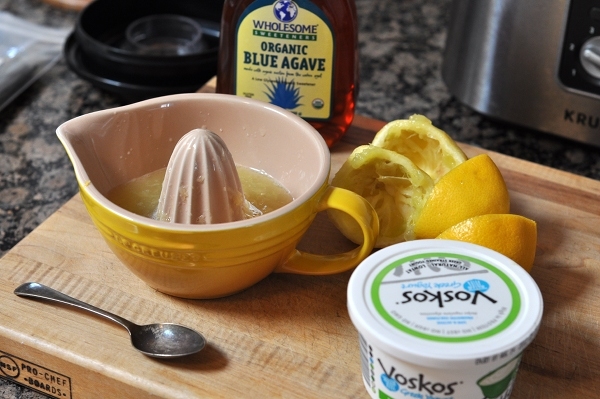 It was perfect for my taste but you could balance things out a little more with more agave or honey and less lemon. I’m providing those variations in the recipe below in addition to my zippy version. Don’t skip the vanilla bean but substitute vanilla extract if it’s all you have. 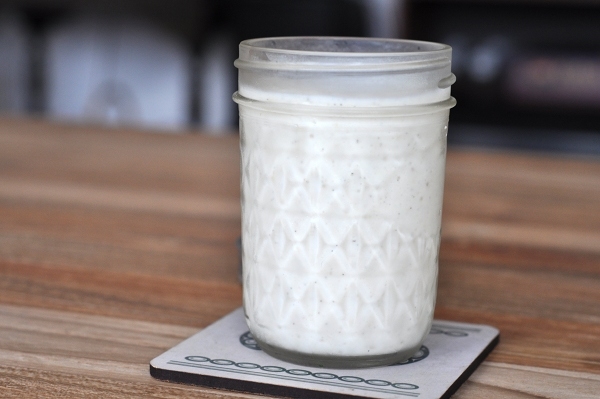 The vanilla bean flavor shows up more after the pudding chills in the fridge for a few hours. I was so happy to come home to a jar of this after some epic dinghy sailing last night even though my frozen toes and fingers could have used a hot drink instead. The vanilla had come through and the texture had thickened since my sample bowl earlier in the day. 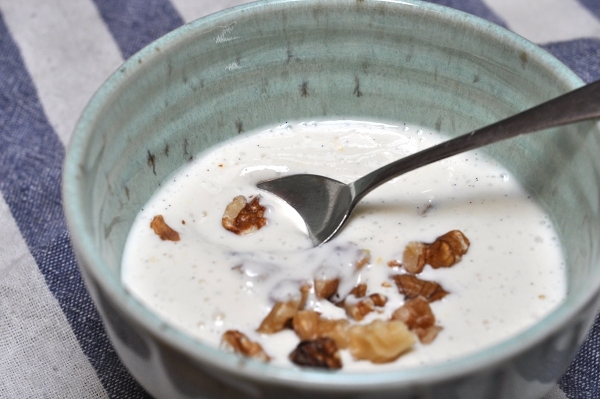 Add everything to the your blender, starting with the tofu and yogurt. For the vanilla bean, slit the entire pod open with a knife and scrape out the dark paste (tiny bean flecks!) with the back of a knife or a spoon. Add this to the blender. Blend, starting on the lowest speed and working your way up, until the mixture is fully blended. Pour into bowls or jars to serve immediately or chill for a few hours or overnight before serving. The flavors will intensify and the texture will thicken as it chills.